Amongst the hustle and bustle of Chapel St, if you wonder down the lane way markets of beach shacks, you will stumble across a little gem, called 'Found'. Pull up one of the wooden seats on the outside deck, or venture inside to a more cosy feel. In winter, plastic sheets are drawn around the small cafe to lock in the warmth, with steel heaters scattered around the chairs and tables. On warmer days, the sheets are open to let the sun naturally warm up your senses. In such a secluded and small cafe, the abundant aroma of coffee is delightful for all coffee lovers, whether your a dreary soul in the morning, or seeking your afternoon break. A selection of newspapers are always available, so take a seat and have a read in the sunshine. The selection of food is small, but adequate for the size of this cafe. A must is the banana bread; I had mine heated up and drizzled with honey - It is such a fresh and delicious treat. The staff are always friendly, helpful and having a laugh with one another. A nice change to your usual busy chapel st cafe who are too busy pumping out orders to ask you how your day is. Once you have finished your breakfast or lunch, why not wander down the lane and browse the shops that offer affordable and unique clothes and jewellery. 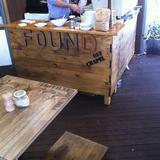 Found is open Monday through to Sat, and the coffee machine is usually switched off around 4.